To the West of Woman Hythe and exposed at low spring tides this barnacle covered kilometre square jumble of Flint revealed a variety of in situ paramoudra linked by sections of smaller sponge locus. The north east directional trend was seen between the first Paramoudra multa in the immediate foreground and the next one 5m away. In September 2016 Dan and I traced this line and found 5 of these distinct flint structures at similar distances apart across the reef. Taller, 1 metre round, Paramoudra tecta rose at the edge of this oval shaped aggregation of sponge structures following the same NE course, their purpose was to baffle the current, drawing nutrients out of suspension. Many paramoudra had shaped upstands to deflect neighbouring sponges exhale and the water’s bearing influenced the tops of most structures in some way. In January 2017 another surge had cleared the sand in front of the reef revealing 7 more P multa on the same line from the south west, trending north east, all at predictable 5m spacings. Next generation placement of sponges would have been influenced by the North East tide that ran across this area during the Cretaceous as the swell from the Equatorial Tethys pushed towards the Arctic Sea along the West coast of Eurasia and across the shallow continental shelf that lay here. The only one known of in the World. I built a grid to map the best preserved sections. It had to flexible to allow for the lumps and bumps of the paramoudra on the reef surface but accuracy was to within 0.05m on the ten metre square frame. I was engrossed mapping sections 1, 2, 3 & 6, 7, 8 then stopped to look at the pattern unfolding as I worked. The north east direction was a shock even to me, with the smaller sponge placements sitting between the larger Paramoudra magna and multa. Each section took about 2 hrs to set up the grid accurately then mark off the flint structures. 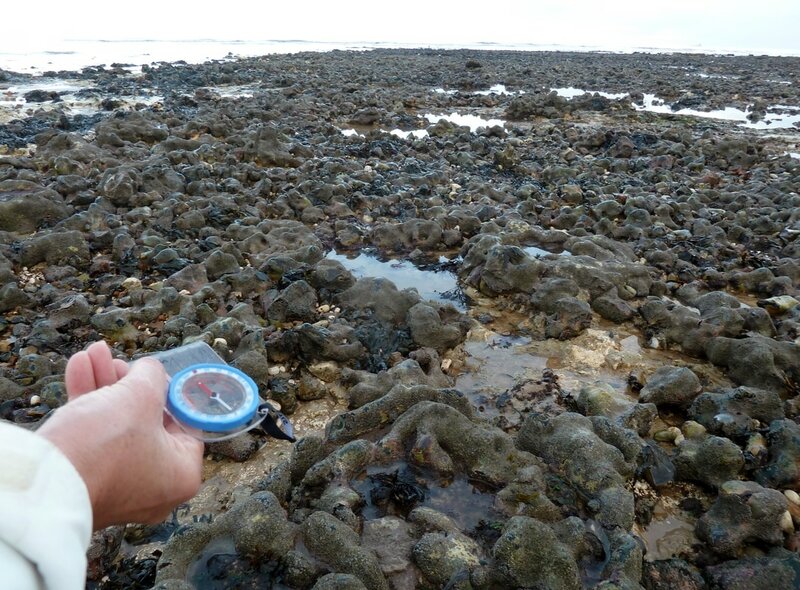 This was done on a low spring tide of 0.6m to allow the longest time for the reef to be exposed. Look again at the picture at the top of this page. It is a jumble and hard to make any sense of but this mapping system works well. I mapped 2 more sections the next day but A & B were the best. The whole reef is slowly being broken up by the tide, but the P magna, which extend deep into the chalk survive. ​West Runton's Cretaceous sponge reef. Looking west towards Sheringham from the cliff top car park at West Runton. The best preserved section of the reef, pictured above, begins at the end of the breakwater. The oval shapes appear at low tides. The reef is very uneven and difficult to walk on and if you step on Bladderwrack seaweed you will slip! I never trust just one instance of something and went looking for other reefs. This is Weybourne, looking south west into the cliff. The flints are what I call tortured and grew in a fast current environment as seen at Wood Hill, Norfolk and Station quarry, Ashwell. ​Notice how the line of flints dip with larger flints to the outer edge. I believe this is looking at a transverse section of a reef that has been subsequently buried by chalk sediment as the strata above levels off. Also search for OSPAR Commission's 'Background document for deep sea sponge aggregations' for information on Atlantic sponge reefs. There are a lot of paramoudra and suspicious oval shapes trending north east near Hamburg. The text is Danish but there is a link on this site to Bromley et al's 1975 paper on paramoudra.